Remove shadow-fixed builds from CI configuration. Since this repository has very few catkin dependencies, there\'s no reason to build for both shadow-fixed and released. Remove settings_keys.h from qt4_wrap_cpp to suppress warning There are no QT-wrappable classes in this header, so the QT build emits a warning that it\'s doing nothing on the file. Since it\'s doing nothing, we might as well remove the file from the wrapper macro. Fix for issue #12; \"Copy Extended\" was only copying blank lines. Add option to alternate row colors for stronger line distinction. This uses the QAbstractItemView\'s alternatingRowColors property to alternate the background color of each line in the log list. You can disable the alternating colors by right clicking on the log, and your preference should be persistent between sessions. Select all nodes when user hits Ctrl+A in the node list. Closes #6. Sync behavior between saving to bags and text files. This closes #10 by using the same behavior when saving to text and bag files. Both now save the same messages that are in the user\'s current view. Partly because this lets the user save subsets or everything by deliberately selecting everything, and partly because it was a lot easier to change the save to bag behavior than vice versa. Handle log messages with multiple lines correctly. This fixes the console to handle log messages with multiple lines correctly. We\'re going to be using a little bit more memory now, but it shouldn\'t be a major issue and performance still seems great. Closes #8. Closes Issue #04 - Subscribe to rosout_agg instead of rosout. I spent an hour adding an option to subscribe to either /rosout or /rosout_agg thinking that we would still need to listen to /rosout when playing back a bag file that only had /rosout recorded. But it turns out that the republisher catches those and puts them on /rosout_agg anyways. I reverted the changes and just changed RosThread to subscribe to /rosout_agg. Fix issue 05 - Node list not clearing out properly. The root cause of this problem was that the message count in the log database was not being cleared out. I\'ve refactored the structure a little bit to make the dependencies a little cleaner. The log database doesn\'t know about the NodeListModel anymore (though the model now knows about the database). This puts things more in line with the log database just being the main source of information, and the node list model and log database proxy being different views onto the database. Saving user settings for issue #2. Fixing a typo that prevented the Fatal-level message from printing. Adds license headers to all code. Adding screenshot for github front page. Adding console_generator.py script to generate fake messages. Remove unused dependency on qt_build, which is gone in Jade. Add extended copy option. This is an extended version of the copy command that also copies extra information like the node name, source file, source line, etc to the clipboard. Change default warning color to orange. Yellow-on-white is particularly hard for my eyes to read, especially out on a vehicle in daylight. Add the ability to write logs to txt or bag files. Fixing an issue with the \"install\" target. Fixing issues found by cppcheck. 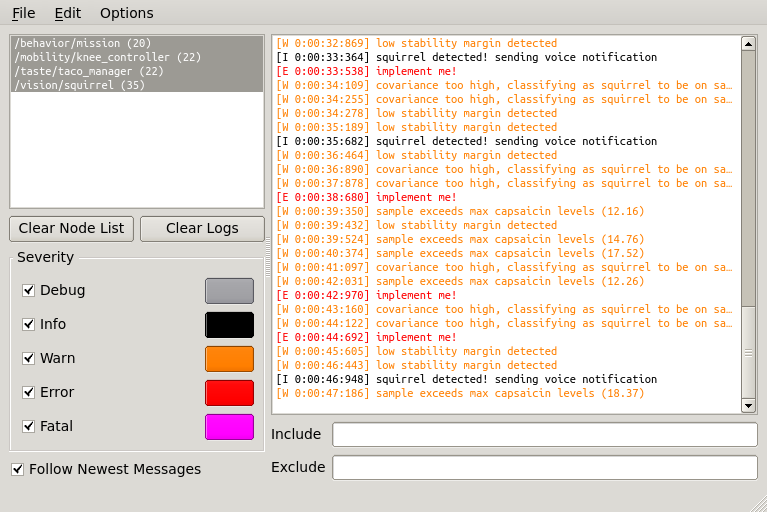 Adding the ability to colorize logs. Adding a menu open to read bag files directly. Setting default appropriate default values for some member variables. Adding a visual cue to the \"Select All\" menu option. Adding the ability to multi-select & copy logs. Cleaning up some catkin_lint issues and adding comments. Fixing issue with master disconnect/reconnect. After merging in ros_thread, I noticed that the console no longer reconnected properly when if the ros core is shutdown and restarted. I think this was due to using ros::Rate to limit the main RosThread loop. I removed this in favor of QThread::msleep so that the loop is independent of ROS. Also removed the added ros::NodeHandle member and initial startRos call that I\'m guessing was added to allow ros::Rate to run without an exception. Using QThread::msleep might be be preferrable anyways so that the console continues to read messages immediately even if we\'re running simulations with the ROS clock turned waaaay down. Fix bug in ordering from processing older messages. The old message processing had a small bug where each chunk of messages ended up in reversed order. For example if you had an ordering like: ABCDEF and change the filtering, they might be reordered as CBAFED This was a small bug that is fixed by correctly building the early messages queue in the proper reversed order. Adding buttons for clearing the node & log lists. Adding comments; cleaning up code; reducing the update rate slightly. Moving ROS processing into a separate thread from the GUI. Adding regexp support to the include/exclude filters. Set window title with node names. Fixing node list selection model. Trying to get better layout sizes. Make substring filters case insensitive. Change include filter behavior. This changes the include filter to pass messages that contain at least one of the substrings instead of all substrings. Adding support for exlude/include filters. Adding relative/absolute times to output lines. Automatically toggle auto-scrolling based on slider position. Adding initial version. Basic functionality, but stays snappy with large logs so far.